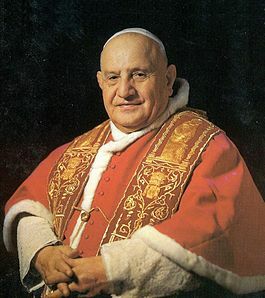 This week Pope Francis announced today the canonization of two recent popes, John XXIII and John Paul II. Each of the men appeals to a different group of people—John Paul II is a favorite of political conservatives and John XXIII of liberals. I guess we shouldn’t be surprised to see the arrival of saints with very different groups of fans. It has always been that way. The roster of acknowledged saints increases steadily year by year. According to the sources I found, there are at least 10,000 saints already, some of them pretty much forgotten, but others actively celebrated every year. It’s easy for nonreligious people to wonder at some of the choices of saints. Does living in a hut in the wilderness really make you a force for good? And why did some women choose to live in a secluded convent where they would never again see their friends and family? Is this what religion is supposed to be? But when you read about saints, you realize that many of them led active lives in the world and their lives can offer inspiration and even hope in our modern secular world. •	She would give everything away. But not all saints went to extremes. Many of them had illustrious careers as teachers, doctors and social workers. In today’s world they would find fulfillment in secular life, but centuries ago there were few options for public life and almost none for women. Several of the saints remembered today chose the life of a single career woman to evade the prescribed and limited role of a wife and mother. 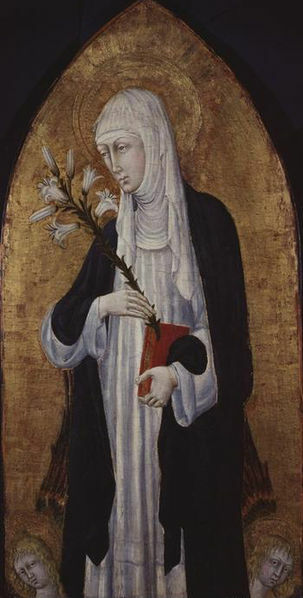 St. Catherine of Siena, like many other female saints, found it difficult to persuade her family that she did not need to marry. She was born in 1347 in Siena, a city that had been hit hard by the bubonic plague, known as the black death, that had killed so many Europeans. When she was 16 years old, her older sister Bonaventura died in childbirth. Catherine’s parents wanted her to marry Bonaventura’s widower, but the girl protested by starting a long fast. She was so firm in refusing food that eventually her parents relented on the marriage. Catherine cut off her hair to discourage other suitors, but she insisted that she did not want to enter a convent; she wanted to stay at home and devote her life to prayer and good works. She once suggested to her confessor that he could “Build a cell inside your mind, from which you can never flee” and it seems that is what she did. Catherine’s interior cell was so strong that she eventually persuaded her father to let her life the life she had chosen. Catherine worked in hospitals in Siena and gradually gathered a group of followers around her. This was a stressful time for Siena and for the papal state in general. Catherine felt called to move into the wider political sphere to try to encourage the reform of the clergy and the strengthening of the pope. She learned to write, something that women were seldom taught during those years, and sent letters to various authorities urging peace between the republics and the princely states in Italy and the return of the Pope to Rome. She negotiated for peace between Florence and Rome. In other words she became a politician and a public figure rather than the wife and mother her family had expected. Her religious fervor was undimmed and she continued to fast so drastically that her own followers begged her to eat properly and take care of herself. Despite her extreme practices, she was able to found a monastery for women and to organize her group followers into a force for good. And she did all this before dying at the age of 33. Did she go too far with her own severe practices? Would she have been even more saintly if she had maintained her health and continued to work for her people and her Church? We will never know the answer. •	For the world to see? •	And I think it puzzled the Good Lord, rather. Really interesting post. And a new poet to read–yay! Thanks.